The Nigerian government has reacted to speculations rife in Ghana that the oil deal signed by President Umaru Yar'Adua and his Ghanaian counterpart, Prof. John Evans Atta Mills had fallen through. Following the oil crisis that hit the country during the first quarter of the year, President Mills traveled to Nigeria to strike a deal with President Yar'Adua to supply 60,000 barrels of crude oil to Ghana, on a ninety day credit basis. The deal, which was widely publicized by the Ghanaian media, was supposed to be implemented after the remaining paper works had been completed, but for close to three months now, not a single barrel of oil has been sent to Ghana by the Nigeria government, prompting fears that the deal had failed to materialize. 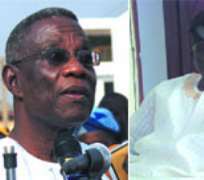 Another school of thought hold the view that the Atta Mills government upon assumption of office, concealed the agreement signed between Sahara Oil Company, an offshore company owned by Nigeria conglomerates, and the government of former President Kufuor. This decision has allegedly affected the current deal, since the Nigerian government cannot directly lift the crude oil to Ghana. However, in an exclusive interview with The Chronicle at his office on Tuesday, the Nigerian High Commissioner to Ghana, Ambassador Senator Musiliu Obanikoro denied that his government was dilly-dallying with the implementation of the agreement. The High Commissioner noted that his country has always come to the aid of Ghana in terms of crude oil supply since the era of former President Rawlings through to Mr. John Agyekum Kufuor. He also contended that the apparent delay for the supply of the crude oil per the agreement had nothing to do with Sahara Oil Company. According to him, the agreement signed by the government of Ghana and the Nigerian oil company (Sahara Oil Company) had expired and was not renewed by the current government. To him, this does not amount to a unilateral abrogation or termination of the contract. Touching on Ghana's oil find, he urged that the nation learns from the Nigerian experience, cautioning that they do not want Ghana to experience the same recklessness of oil exploration and management in Nigeria. “We do not want Ghana to fall in the same pit, if you look at the management of your gold, I don't think Ghanaians are happy, and I am sure they don't want a relapse of that as well, so there is something to learn from what has gone on in this country in the past and also from the experience of Nigeria in terms of what went on in the oil industry,” he advised. When asked whether the Nigeria government was interested in Ghana's oil, he said “I do not believe we have done enough with the one we have, I don't see why Nigeria would be interested, we are happy that Ghana has discovered oil too, because we know too well that it will impact on her citizens”. He urged Nigerian citizens in Ghana to be law abiding and God fearing, which behaviour would stand them the opportunity to gain from their stay in Ghana, than to be seen as criminals. Turning his attention to the economy, he said the country has a small economy, but it is on track, looking at the way government is managing it. Mr. Obanikoro said Ghana has not been exempted from the global recession which is impeding against growth, but was hopeful that things would turn round.